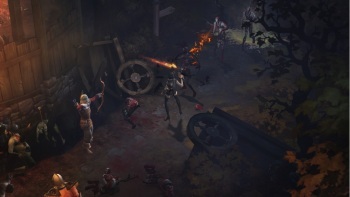 An 18-year-old Taiwanese teenager has died after playing Diablo III for 40-hours. If reports from the local media are to be believed, an 18-year-old male identified only by his surname, Chuang, died after spending nearly two days playing Diablo III in a private room of an internet cafe in Tainan, southern Taiwan. He entered the room at around noon on July 13th. He then spent the next 40 hours gaming. Eventually, an attendant found him asleep on a table on the morning of July 15th. When the attendant woke him, the teen stood, took a few steps, then collapsed. The police are currently investigating the cause of death, and an autopsy is to be carried out. They speculate that numerous hours spent hunched over the keyboard created cardiovascular problems which, when combined with fatigue, proved too much for the young gamer. Tales of death and misery following insane gaming binges seem to be becoming increasingly common in Asian territories. Assuming Chuang's gaming marathon did directly contribute to his death, this will be the second such case in Taiwan this year. Back in February, a man in New Taipei was found dead of cardiac arrest following a 23-hour gaming session.